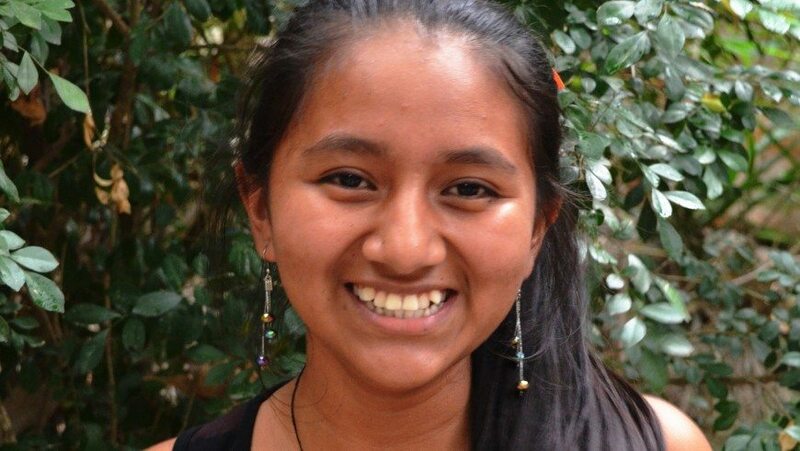 Esli, 20, is in her third year of college at the Universidad Nacional de El Salvador, where she is studying International Business. She lives at home with her father, a farmworker, her mother, who cleans houses, her older sister and two younger brothers. Her evenings are spent studying and helping her family around the house. It is not until 10:30 or so that Esli allows herself to crawl into bed each night. We asked Esli a to answer a few questions to get to know her better. Below are her responses! I want to get a college degree in English and I�d like to take contemporary dance classes. Thanks to the education I�m receiving, I�m growing as a person. One of these days, with God�s help and with help from my parents, I�ll be a successful professional; I�ll be able to help out my parents, and help my siblings do better for themselves so, one day, we can have some of the things we are lacking right now. The first thing I�d want to do is buy a big, beautiful house for my parents. Describe someone who has inspired or motivated you. My parents are my greatest motivation. Even though they don�t have college educations, they are the best examples, to me, of what it�s like to overcome. They�ve instilled this in me by guiding me and giving me support when I�ve needed it most. Right now, my sister is also a role model because, thanks to her own efforts and support from my parents, she is just starting her college career. It�s affected me a lot because before, it was no problem for me to leave the house for a little bit and go walking close to home. But now, I only leave home to go to school or to do homework. I feel scared and terrified because it�s not just the gang members or people related to gang members who are at risk, it�s everyone, especially young people. From 8:30pm on, the doors to my house are shut and I can�t go out to do homework because I�d be running the risk that something might happen to me. Parents shouldn�t neglect their children; they should give them confidence, teach them values and guide them from an early age. Learning begins at home but most of the time it is the children who choose the wrong path so the best method would be to instill civic, moral, religious and ethical values in children from a young age. I�m working [with other scholarship students] on a backyard vegetable garden. It�s important to me because I�m learning about the benefits of fruit and vegetable production for my home and for other people. In my free time I like to exercise, listen to music, watch TV and sometimes read. I also go to mass on the days I leave school early. I like �Cien A�os de Soledad,� by Gabriel Garcia Marquez, �Ancient History of the World,� and �Lazarillo de Tormes,� which is an adventure story. Bachata is my favorite type of music. I�m a fighter, I don�t give up, I�m responsible, I work hard at school, I�m respectful and I put into practice the values I�ve learned at home.